and sign up and pledge. I did the 30 Days of Biking in 2011 and 2012. Last year, I got a kick scooter and decided to change things up a bit by doing the #30DaysofScootering. I think I was the only person to do that, but I had a lot of fun so this year I'm doing it again. So yes, next month you will see a post here every day about my scooter adventures. I'll take some pictures and I'll write some stuff. I may even subject y'all to some of my poetry. 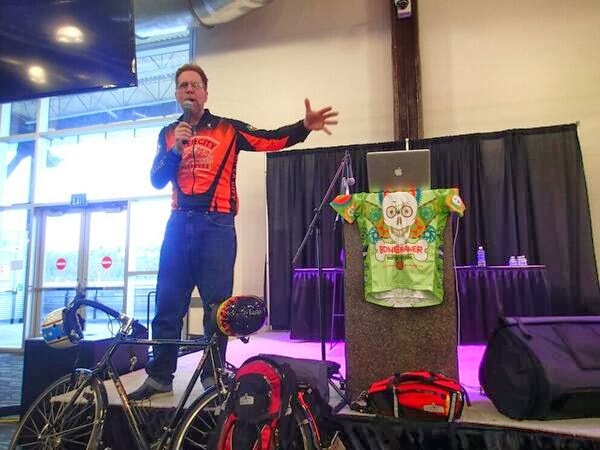 I'd love to hear what other #30Daysof... adventures folks are having, so if you're biking, scootering, unicycling, paddleboarding, longboarding, solowheeling, hang gliding, hiking or whatever, drop me a note (kentsbike at gmail dot com) or leave a comment on the blog. I'd love to highlight what some other folks are seeing as they get out in the world under their own power. 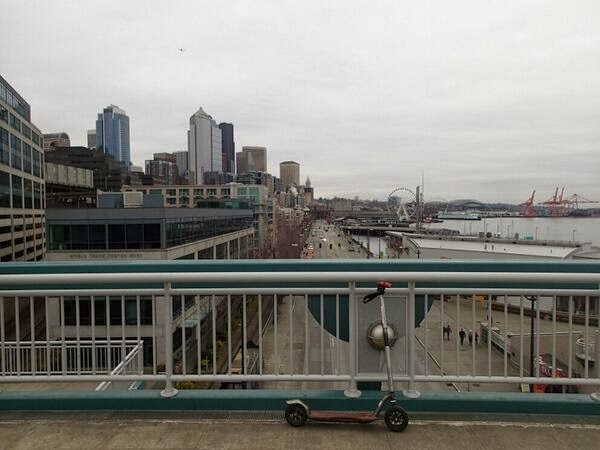 Also if anybody else is doing #30DaysofScootering, I would be thrilled to hear from you. You can also message me on Twitter where I'm @kentsbike. Here's looking forward to an active April. Bike advocates are fond of stating that 40% of all trips are two miles or less and it's really pretty silly to drive such a short distance. I agree with this basic premise, but I've also found that there are times when even a bike more vehicle than I need for such short trips. For my four block commute, for example, lugging my bike up and down the stairs and then locking it up at my destination added more time and complexity to the trip than was worthwhile. Add multiple stops, crowded sidewalks or tight space on public transit and the mind naturally looks for something smaller and simpler than a bike. 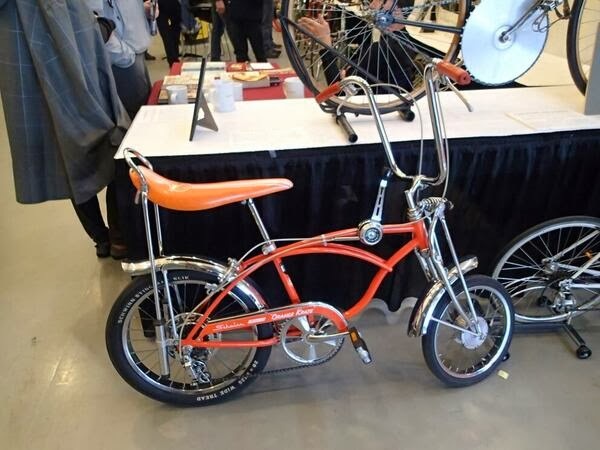 It's called the HalfBike and it's on KickStarter right now. While I could see people being intrigued by this device and it might be fun to ride, it's not something I see myself using. It looks like it's going to retail for $899 and there are a lot of things, including bikes, that I'd rather spend my money on. The SoloWheel is a compact, electric laptop vehicle that is easily carried and looks fun as heck. It's also a bit beyond this bike mechanic's price range. The wheels are bigger than what you see on the kid's Razor scooters and they roll fine over cracks and ruts. I did a lot of research in the year before I got my scooter and I've kept a close eye on the scooter world since I got it. I still think my scooter, a NYCeWheels KickPed , is one of the nicest adult kickscooters available. It costs $239 and I think it's worth every penny. There is some debate in the scooter world about hand brakes and foot brakes. I've never missed having a front brake (if I did, I'd put one on, I'm a tinkerer!) but interestingly you can spend less and get more by getting a Go-Ped Know-Ped . This is made by the same folks who manufacture my scooter but it has a wider deck (heavier & less efficient for kicking), a front brake and a painted rather than lacquer finish. But it's currently selling for about $70 less than the KickPed on Amazon and the folks who have Know-Peds seem just as happy with their scooter's as I am with mine. I really like the grippy tires the KickPed/Know-Ped comes with. In this wet climate I don't think I'd feel as safe on a scooter with urethane, although such machines are generally lighter and faster. The Micro Black is such a scooter and it gets good reviews. In the year that I've had my scooter, I've become something of a scooter evangelist. 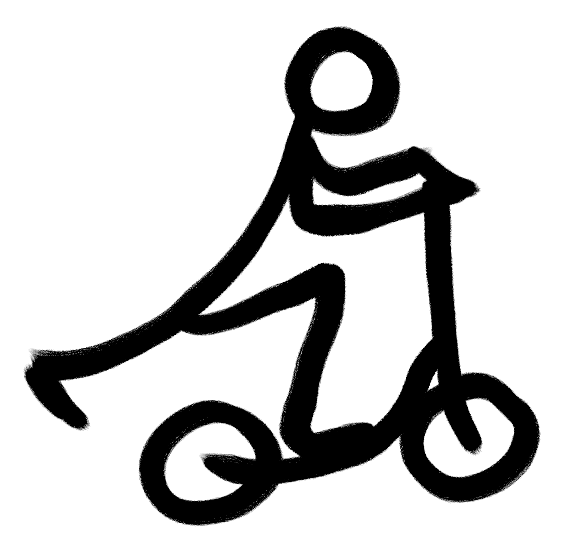 Scooters are fun, they're good exercise and I think they are a great solution for short trips. 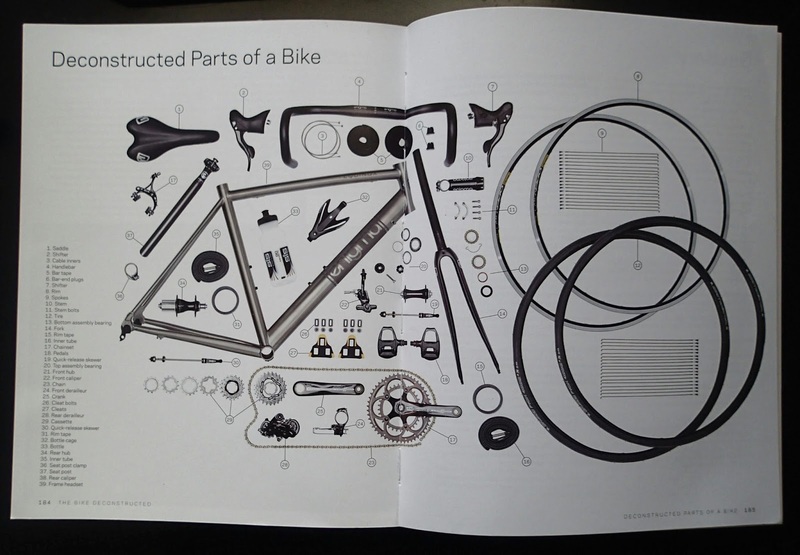 The Bike Deconstructed is an elegant book. 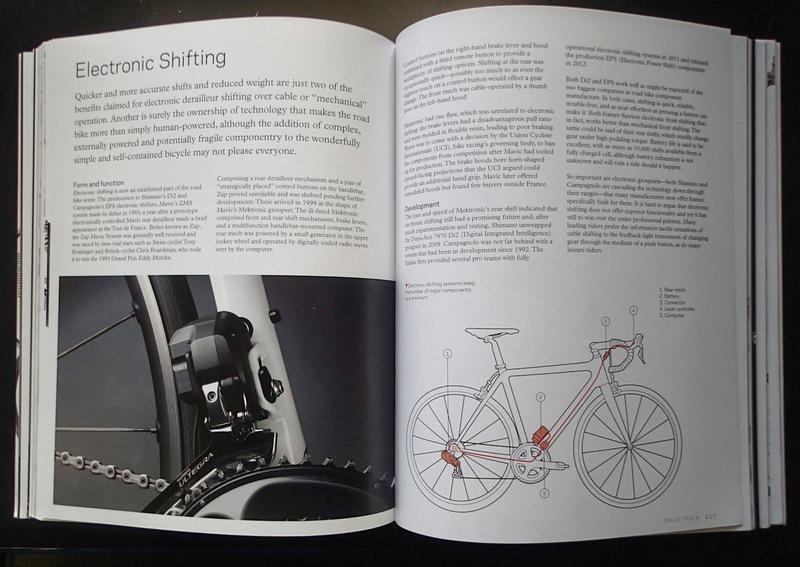 Subtitled "A Grand Tour of the Modern Bicycle" this 8 by 10 inch volume is a nearly 200 page visual and textual examination of the various mechanisms that combined make the delightful machine we call a bicycle. It is a book best browsed, taken in small chunks and contemplated over time. For that is exactly what Richard Hallett did in constructing this book. 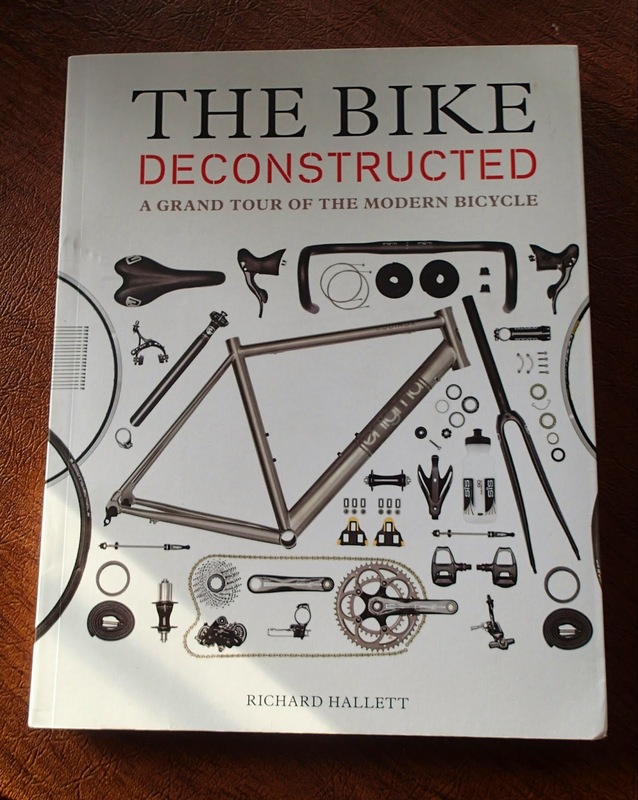 With clear photographs and prose, Hallett examines each bit of the bicycle. As each part is contemplated histories are revealed and options explored. Hallett's gaze is through the lens of now, but the past is not forgotten, indeed as Faulkner noted, it's not even past. 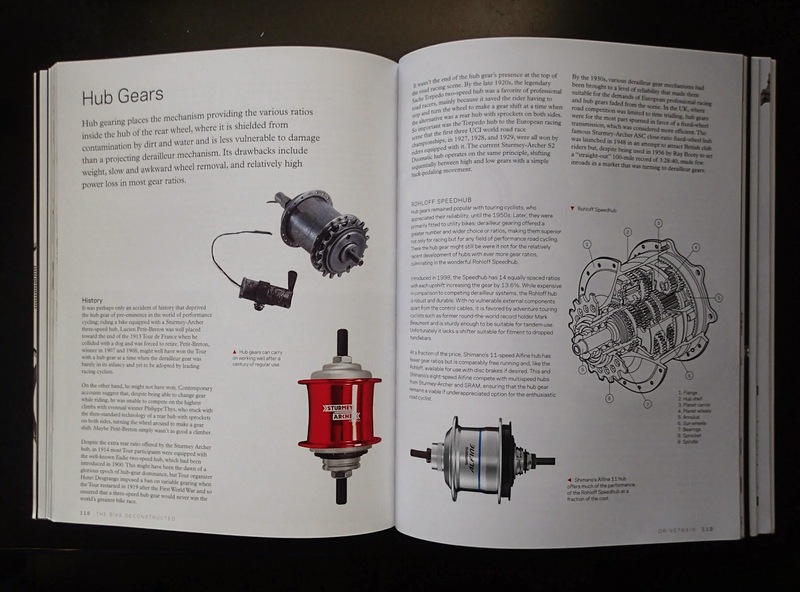 So we see electronic shifting but also hub gears. Carbon fiber is here but so is steel, aluminum and titanium. 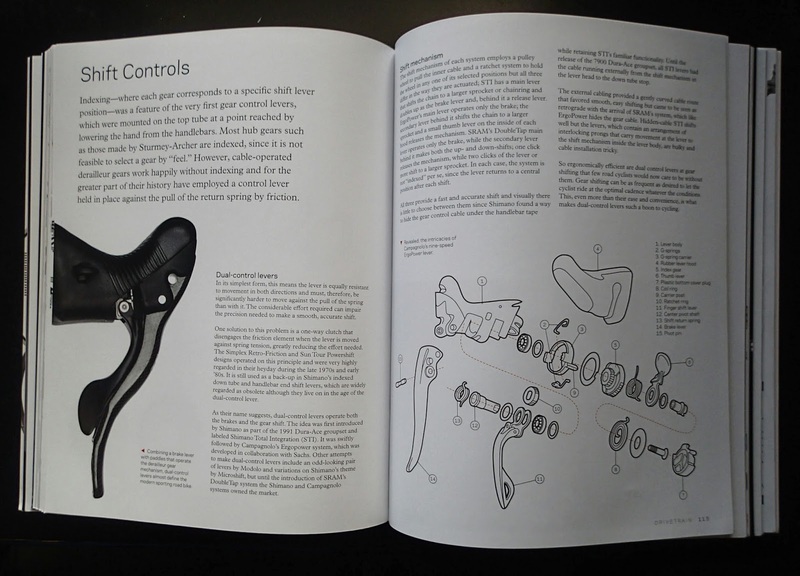 This is a book a child will find fascinating but The Bike Deconstructed will also reveal some new insights to the even the most grizzled of bike gurus. 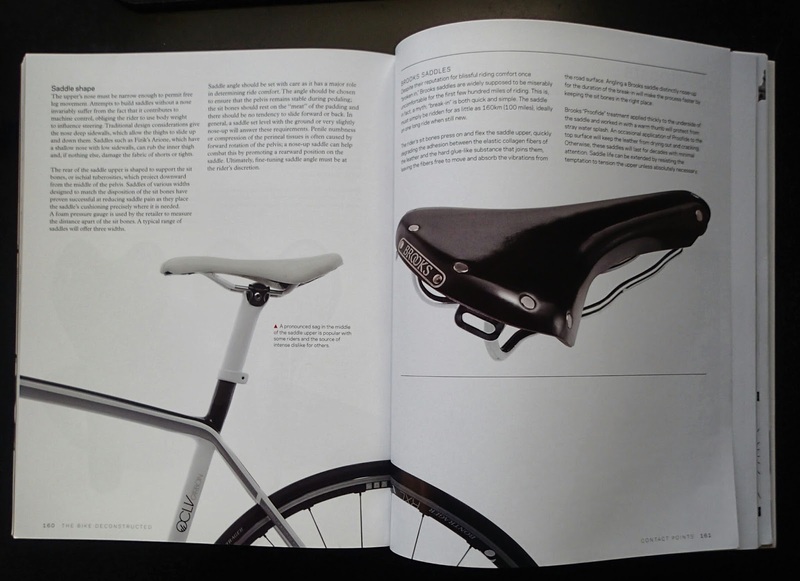 This is a book for those that gaze at bicycles with a sense of wonder. This book informs that wonder and the knowledge of the parts increase our appreciation of the whole. 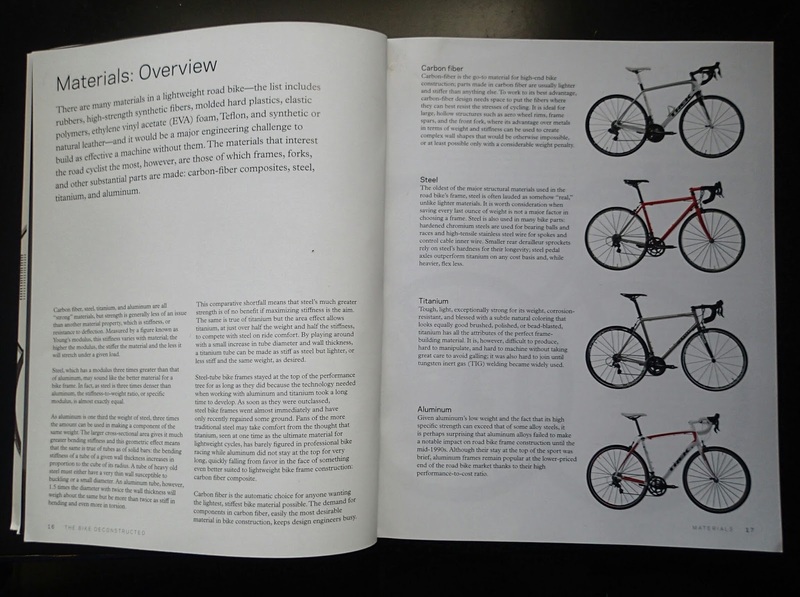 Fans of recumbents and mountain bikes may lament that their machines are not considered here but Hallett has chosen to restrict his scope in this volume primarily to the conventionally framed modern road bicycle. I cannot call this a fault of the book, for the extreme focus has brought forth great clarity. 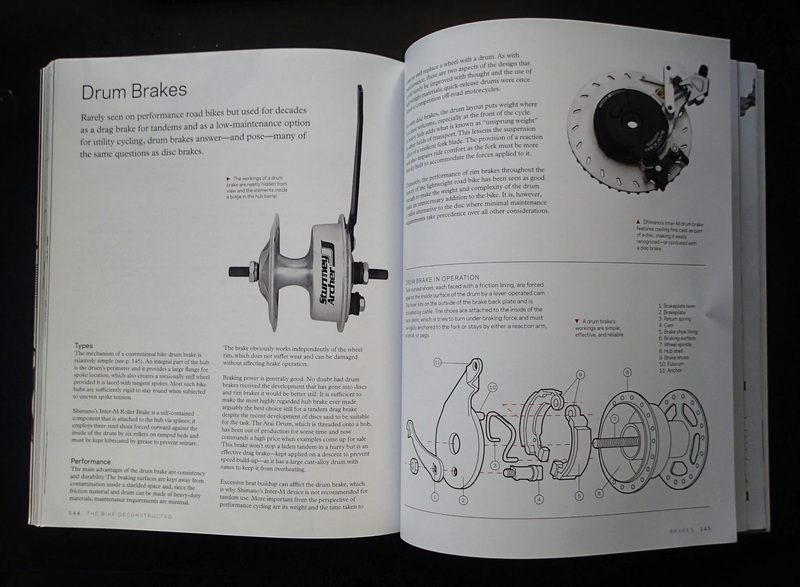 This book, like the bicycle itself, offers something for both the poet and the engineer. That something is beauty and it is presented beautifully in the words and photographs that fill the pages of this book. 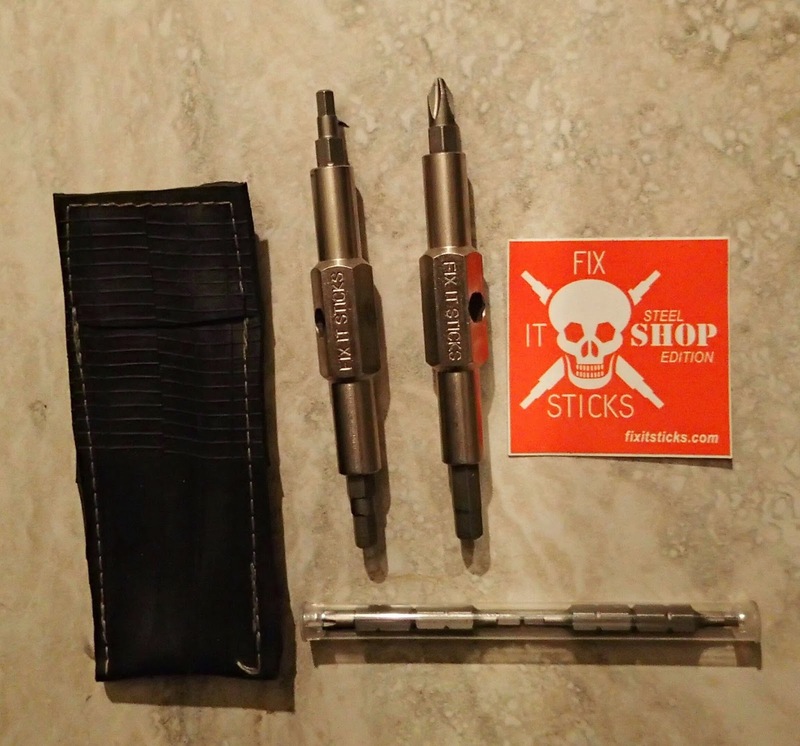 Last year Brian Davis ran a successful Kickstarter campaign to launch Fix It Sticks. The original Fix It Sticks were (and still are) a couple of light, strong hunks of aluminum with steel bits on each end and a hole in the middle that lets the two sticks fit together to form a T-wrench. 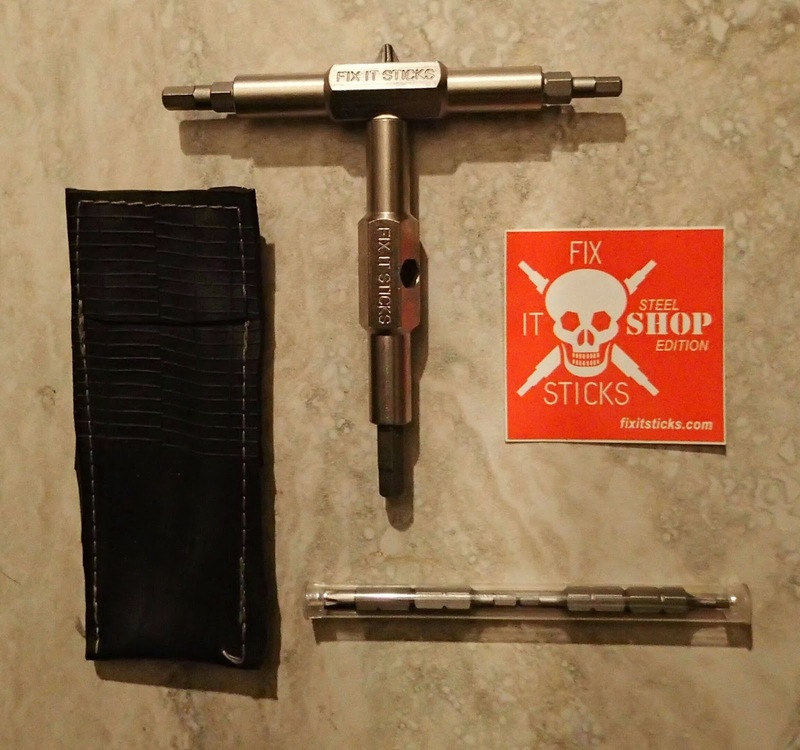 My original set of Fix It Sticks is still going strong, but last week I got my hands on Brian's latest version of Fix It Sticks and he's made a good thing even better. First, the bad news for you weight weenies out there, the new Fix It Sticks are a bit heavier than the old ones. The new sticks have nickel-plated steel bodies and magnets that securely hold various interchangeable bits in place. The original Fix It Sticks came in various configurations (say 3, 4, and 5 mm Allen heads and a Phillips screw head or 4, 5, 6 mm Allen and a T-25 Torx head), you had to make your choice at the time of purchase and that was the set of tools you had. The new Fix It Sticks come with two sticks and eight bits (2, 2.5, 3, 4, 5, 6 mm Allens, a PH2 Phillips head, and a T-25 Torx. The sticks and the bits all fit together in a handy rubber pouch made from a bit of recycled bike inner tube. The magnets work really well at holding the bits in place. It takes a very strong tug to get them out, and they also keep the tool solidly in the T configuration for use. If you need a bit that isn't included with the Fix It Sticks any steel bit with a standard hex base will fit. You can find a wide range of these bits at any decent hardware store. I've always been a guy who travels with tools and I appreciate people and tools that do their job well. Brian Davis is one of those guys and his Fix It Sticks are a good tools that are now even better. BTW, full disclosure here, Brian did send me the Fix It Sticks for free, but I gotta tell you, I get lots of freebies that I don't rave about. These things work well. And oh yeah, my pal Hughie said he thought the recycled inner tube pouch was "cheesy". I think it's cool! 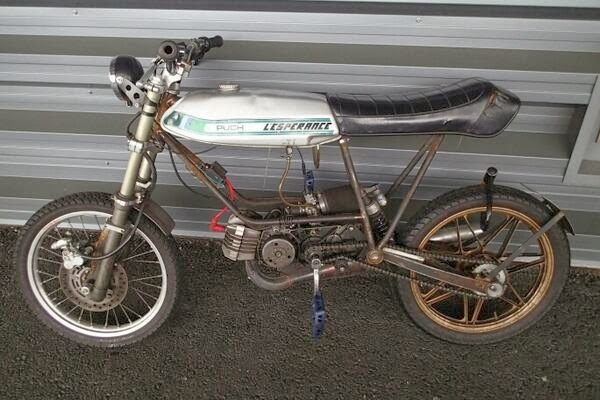 The BMX bike with the seat too low. She saw him every day. Perhaps his mom is thoughtless. Kids don't know these things. We have to teach them. That the light had changed. He'll never ride his bike again. Or say she missed him. More urgent than the text from Marci. Is he dead on the road? Or lifeless in the back of a car? I normally work on the weekends so my virtually weekend is midweek, but Mike and Hughie said that they could handle things at the shop on Saturday March 1st, so folded up my scooter and hopped on the handy Sound Transit 554 bus from Issaquah to Seattle. 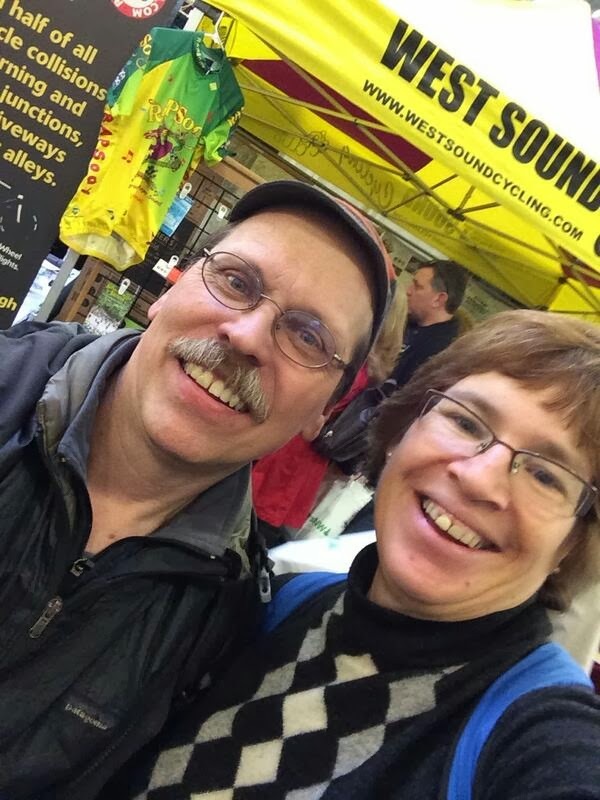 Once I got to downtown Seattle, I scootered off in the general direction of the Seattle Bike Expo. 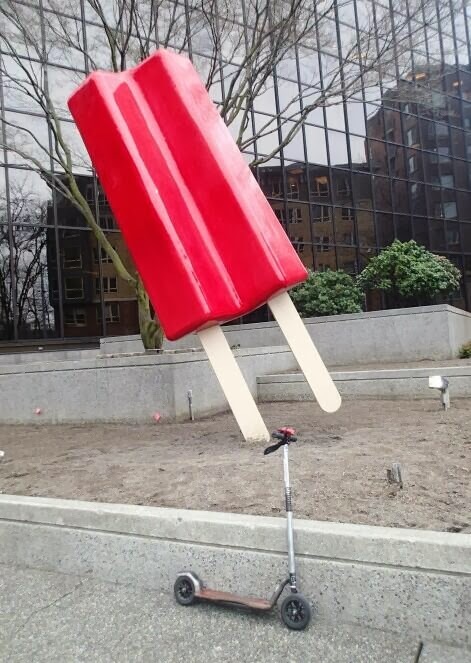 Along the way, I stopped to check out this sculpture. It is not as delicious as it appears. It was a nice, overcast morning in Seattle. In the background of this shot you can see the Seattle waterfront Chump Hoister and several of the metal dinosaurs that always seem ready to attack the city. 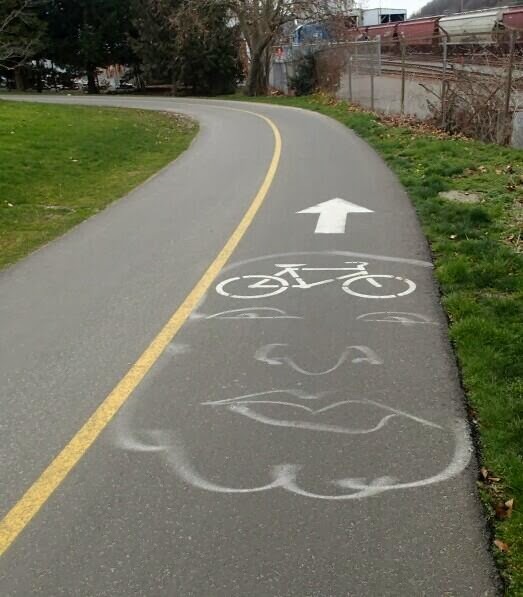 I scootered north on the waterfront bike path with bikes on the brain. 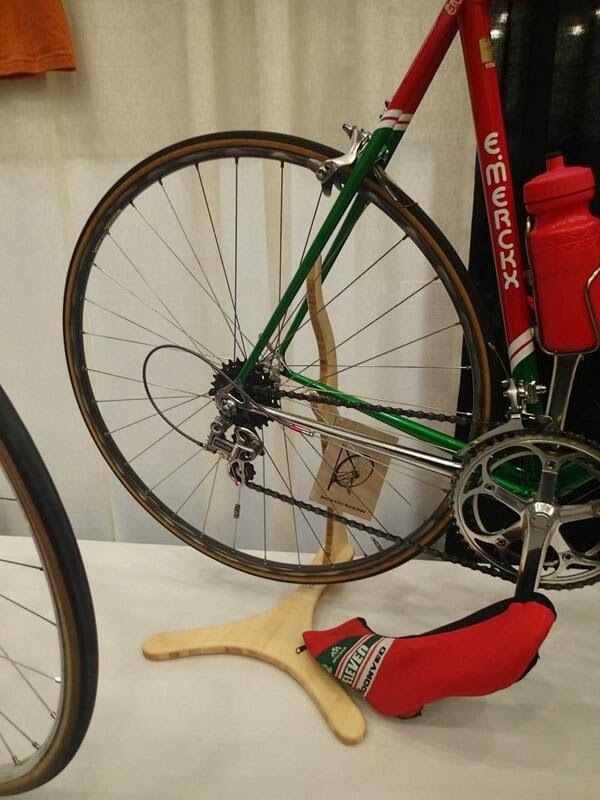 At the Expo I saw about a zillion people I knew and there was lots of bike stuff. This is by no means an exhaustive report, but here are a few photos of some of what I saw. There is always a big display of classic bikes. This Orange Crate brought back memories of my youth. 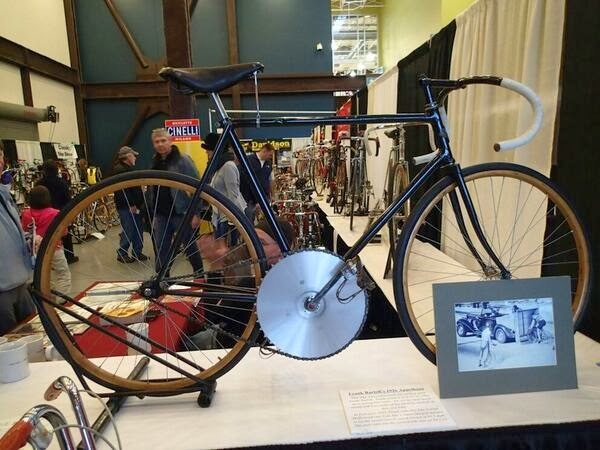 This speed record bike would not be a good choice for hill climbing. A lot of the bikes have a great story behind them. 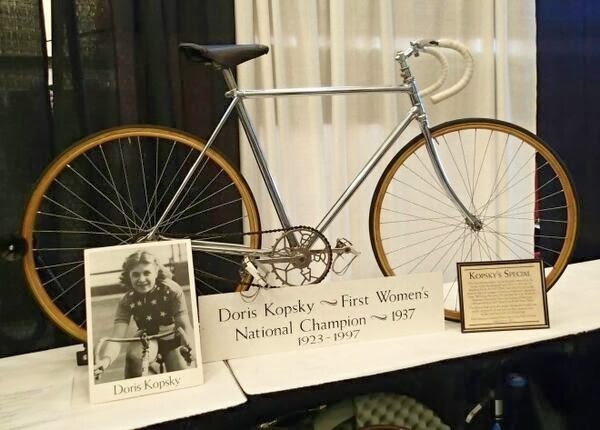 This is Doris Kopsky's championship bike. 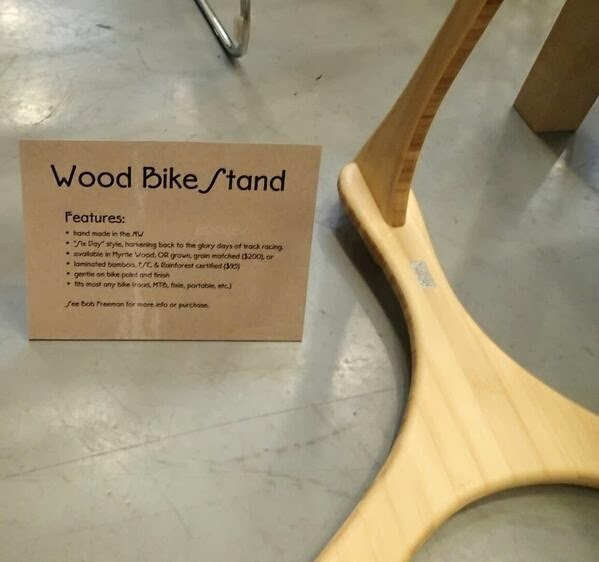 One of the coolest things at the Expo were these lovely wood bike stands. A little more detail on the stands. If you want one, contact the folks at Elliott Bay Bicycles. 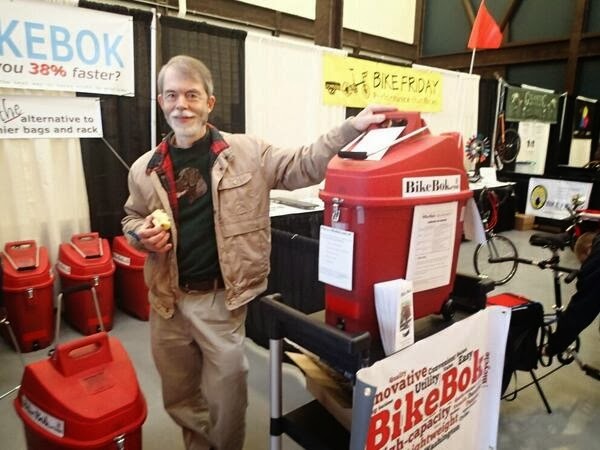 Peter is the inventor of the BikeBok, a light, weatherproof, secure alternative to panniers. Peter and his family live on Whidbey Island. In a note from the "it's a small world" department, Peter's wife Beth and my wife Christine have been friends since 7th grade! Here's another shot of the BikeBok. 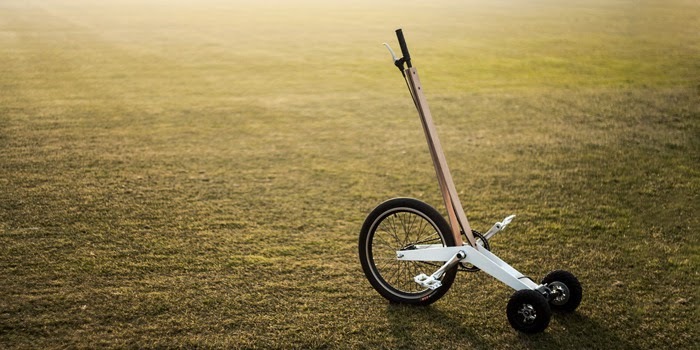 It doesn't require a rack but attaches securely to a wide range of bikes via a clever seatpost bracket and a modified quick-release fitting at the bike's rear axle. 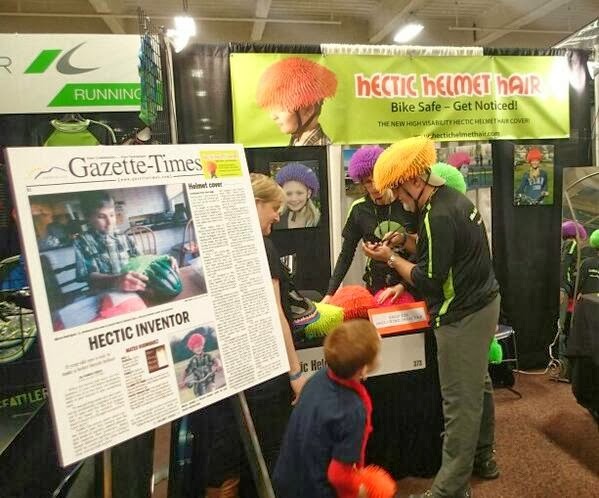 In case you were thinking "I like my helmet, but I wish it looked dorkier", the folks at Hectic Helmet Hair have you covered. 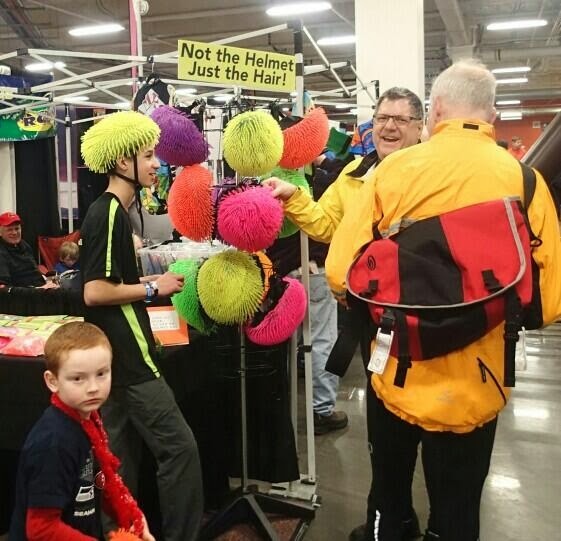 Hectic Helmet Hair is available in a range of non-subtle colors. 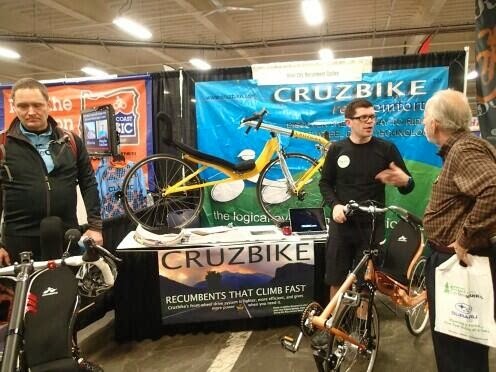 The CruzBike folks were showing off their light, front wheel drive recumbents. 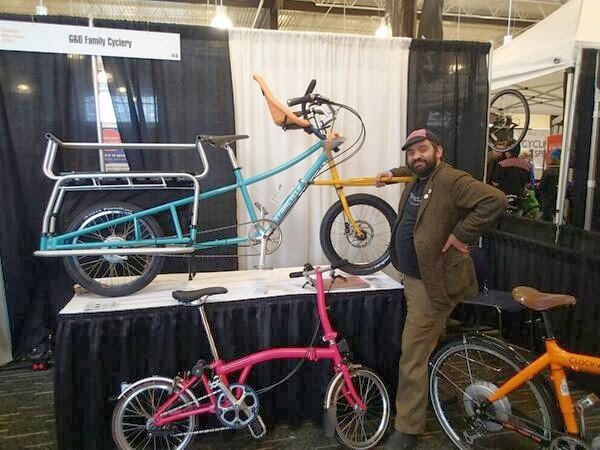 Morgan Scherer is always ready to chat about family and cargo bikes. 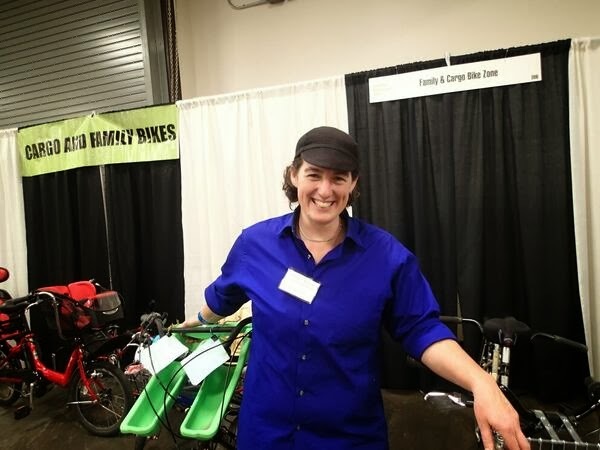 She and Maddi (@familyride) Carlson took turns staffing the Cargo and Family Bike booth. Another bike proponent of Family and Cargo biking is my buddy Davey Oil. Davey pedals what he preaches out of his shop G&O Family Cyclery and he had a variety of "Oh my god that's so cool" bikes on display. Of course I spent a lot of time catching up with people I know and I connected in real life with a few folks I'd only known through my blog or Twitter. Sally Hunt and I had to do that selfie thing that all the kids and world leaders are doing these days. My buddy Joe Kurmaski kept the crowd enthralled with his old-time preacher revival-style stories of life on the road. 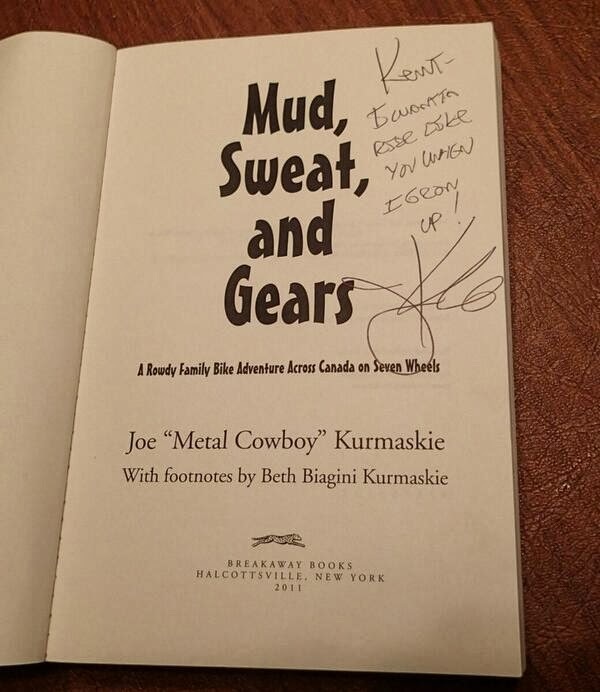 I got a deal on this copy of one of Joe's books 'cause he'd scribbled in it. It's a proven fact that if you want to get more internet traffic, you should add pictures of cats to your blog. So here you go. 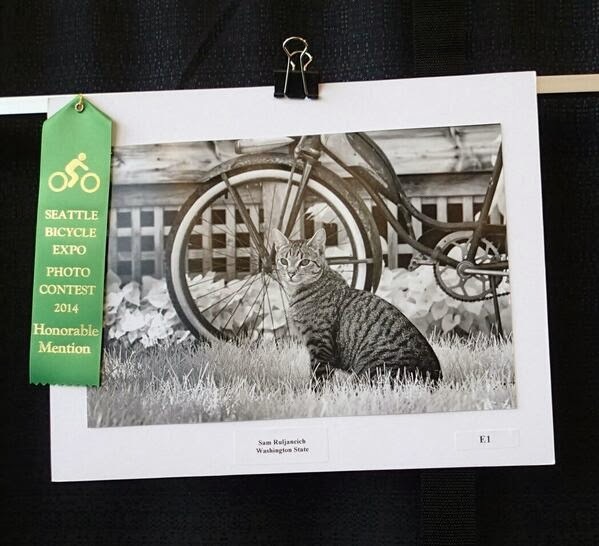 I cast my "People's Choice" vote for this picture in the Bike Expo Photo Contest. There were a ton of bikes I didn't take pictures of, eventually things begin to blur together. As I left the Expo, I did see this old moped, which caught my eye. Anyhow, it's Sunday morning now. 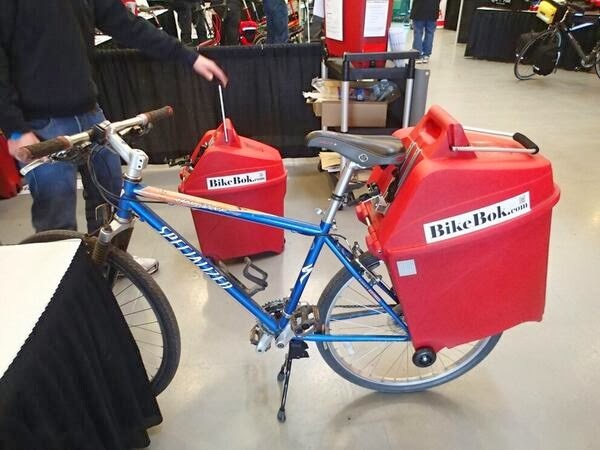 The Bike Expo runs for one more day in Seattle, so if it's March 2nd when you're reading this, you can still go. If not, there's always next year.